If I would have been more timely with my Viennale-reviews, I would not now be pretty much the last movie blogger on this planet who adds his voice to the high – and highly deserved – praise for “Birdman”. Hell, I didn’t even beat the Oscars to it! Unfortunately, real life – and my work for fictionBOX – once again interfered. But, as the saying goes: Better late than never, right? 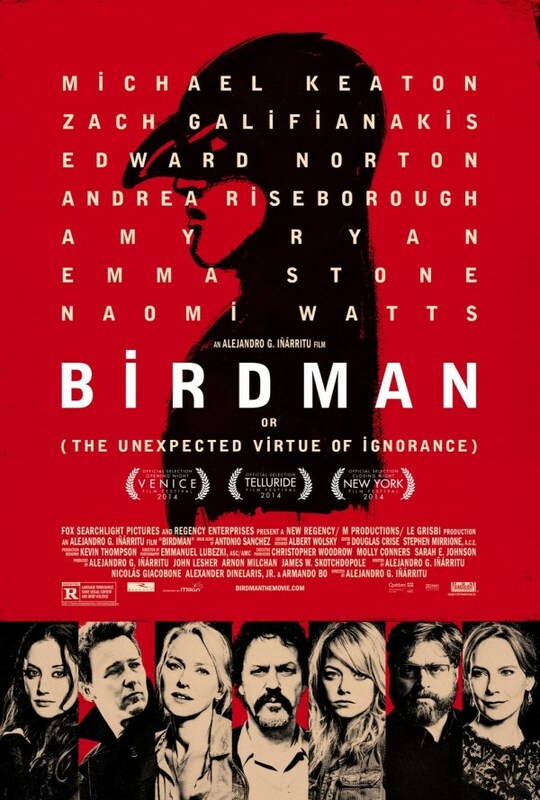 So for those 5 people who either live under a rock or who, despite all those positive reviews and the oscar-wins, are still undecided if they should give “Birdman” a try: Yes, it really is that good. Almost feeling like a lighter, funnier and more playful version of “Black Swan”, “Birdman” is a highly entertaining look on artistry, obsessiveness, the desire to be relevant, self-doubt, (self-)delusions, the clashing of divergent personalities, and so much more… – all offered up with an incredible, frantic level of energy, stellar performances from an all-star cast, and many hilarious scenes. One of it’s most remarkable (and oft-cited) features is the impression that it consists of only one long take. That doesn’t mean, however, that the movie is supposed to be in real-time. Sometimes, the passage of time is marked by time lapse-scenes while the camera points towards the sky. More often than not, however, we clearly go from one day to another simply by switching the location, with the occurred passage of time only remarked on by the protagonists, but not felt by us as a viewer. It can be a little irritating at first, but once you got accustomed to it, it’s vital to the “force of nature”-like energy that marks the movie. It’s also more than just a gimmick, since it gives the proceedings a very surreal tone, and also adds quite a few layers to the movie – not the least of which being that it unfolds (and feels) like a play, but without having to forego the greater directorial and/or dramaturgical freedom that comes with film. Another strength of “Birdman” is the obvious meta-level. Granted, in contrast to his movie alter-ego, Michael Keatons career never really halted, but after the 90s, his star nevertheless did fall a little bit. In addition to the obvious Batman-reference (small aside: After seeing him here, I kinda wish Snyder would have approached him for “Batman vs. Superman”), it’s clear that Riggan is at least partially based on Keaton. At any rate, I can’t think of anyone who would have been better suited to play the part, and Keaton absolutely shines in the role, giving us the performance of a lifetime (one that tragically wasn’t acknowledged by the Academy). Not that the rest of the cast isn’t great either. Edward Norton is the wild card of the movie (and the play it depicts), and amps the energy level up yet another notch. Emma Stone plays Riggans daughter with an effortlessness and genuineness which makes it all look so easy, even though it most certainly isn’t. And Zack Galifianakis finally branches out from the obnoxious characters which he got typecast for as of late. Naomi Watts, Andrea Riseborough and Amy Ryan, who all give equally great performances, round up the stellar cast. This entry was posted in cinema 2014, movie reviews, Viennale and tagged Alejandro González Iñárritu, Amy Ryan, Andrea Riseborough, Birdman, Edward Norton, Emma Stone, Michael Keaton, Naomi Watts, oscars 2015, Viennale 2014, Zach Galifianakis. Bookmark the permalink.